In this example, the film earned a total score of 72.33, which means it would receive an Award of Merit. The Writer, Director, Editor and Audio Engineer would also receive Awards of Merit, and the Director of Photography would receive an Award of Excellence. 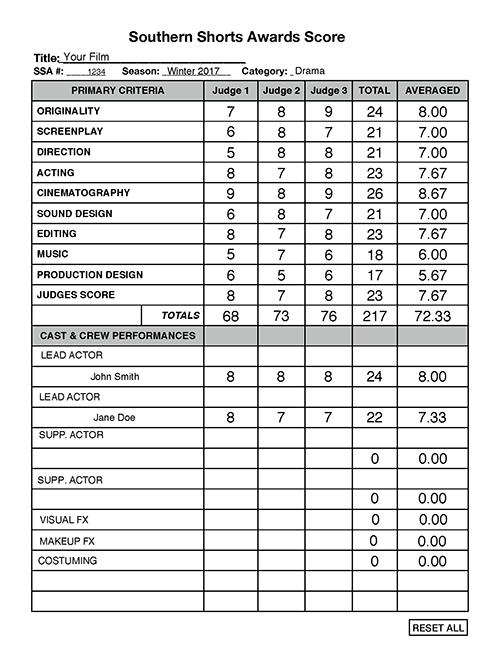 For a Cast or Crewmember to receive an award, all three judges must nominate them with an average score of 7 or higher. So in this case, John Smith would receive an Award of Excellence and Jane Doe would get an Award of Merit. Each of the 10 criteria are scored on a scale from 1 to 10. A perfect score would be 100. Films must receive a minimum composite score of 70 to receive an award. • Supporting Actress • Make Up Artist • Costuming • Visual Effects. Individuals must earn a composite score of 7 or higher in order to receive an award. As an example, if a leading actor had an outstanding performance and all three Judges awarded them an average of at least 7 points, they could receive an award even if the film did not.